District #4 FCCLA STAR (Students Taking Action with Recognition) was held at Exeter-Milligan Public Schools on January 15th. FCCLA STAR participants from Exeter-Milligan, Cross County, Doniphan-Trumbull, Bruning-Davenport and Sutton competed in the competitive events that provide leadership skills, focus on the multiple roles of the family, showcase specific lifetime skills in character development, creative and critical thinking, interpersonal communication, career preparation and practical knowledge. 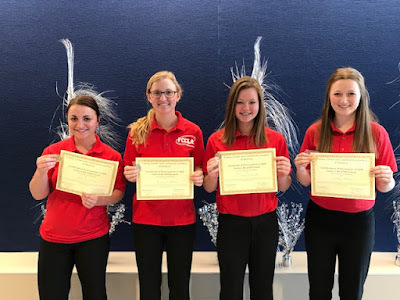 Exeter-Milligan's FCCLA STAR participants were (pictured below - left to right): Kaitlyn Vavra- Illustrated Talk: Dementia-The Disease You'd Like to Forget- Gold Medal, Hannah Horne- Leadership: Finding My Leadership: Silver Medal, Daisy Kanode- Illustrated Talk: Depression- Just Snap Out of It- Silver Medal, and Caitlin Murphy- Recycle & Redesign: Patchwork Plastic Pouf- Gold Medal. All advance to State Leadership Conference on April 9th.